Lysis is the pen name for a former computer programmer and network administrator who now studies biochemistry and biology while ghostwriting for clients. She currently studies health, medicine and autoimmune disorders. Lysis is currently pursuing a Ph.D. in genetic engineering. When a treadmill stops running, it's frustrating since it ruins a workout. A treadmill that stops running after starting the workout can mean something is wrong with the belt, platform, motor or speed controls. 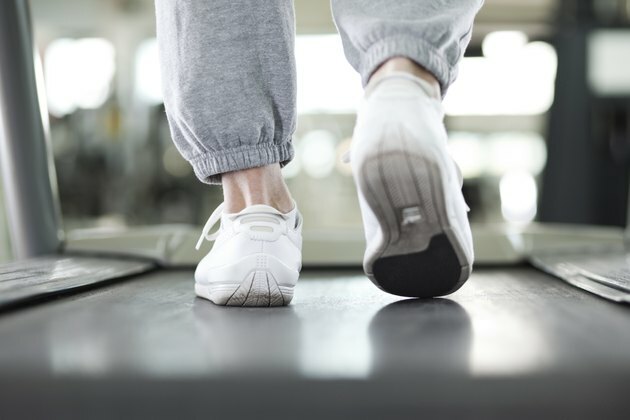 When too much resistance occurs during a run or walk, the treadmill stops running to avoid any damage to the motor. This is a safety precaution to preserve the motor and to avoid excess heat which can cause fires in the home. A treadmill owner can check a few issues with the treadmill to identify any problems that cause the treadmill to stop running. Observe the belt to detect any fraying. When a belt becomes worn, the frayed area creates more friction and resistance. This increases the heat and power requirements on the motor. The treadmill detects the problem and shuts off the power. If the belt is loose, use the allen wrench to tighten the tension by adjusting the screws on the back of the treadmill. Turn the screws 1/4 inch clockwise to tighten the belt. Feel the area in the center of the platform underneath the belt. This area should feel slick. If the treadmill platform and belt aren't lubricated, friction causes too much resistance, and the motor shuts down. Lubrication oils can be purchased online or at a local treadmill repair shop. Check the power cable to ensure it's tightly inserted in the wall socket. Some treadmill power problems can be as simple as a loose cord. Check to ensure the cord is inserted into the wall socket. Check the speed controls. The best way to check the speed controls is by starting the treadmill at a slow pace. Let the treadmill run for a few minutes and jump on the belt to start walking. Change the speed of the treadmill. If the motor stops running, it could be the speed controls. How do I Lube a Horizon Treadmill?